The L.R. Baggs StagePro is a side-mounted class A preamp/EQ that features volume, treble, midrange, bass, notch filter and phase inversion controls with a built-in tuner. The preamp's all-discrete circuitry is based on the award-winning L.R. Baggs Para Acoustic D.I., and is specially voiced for the Element pickup (pickup not included). 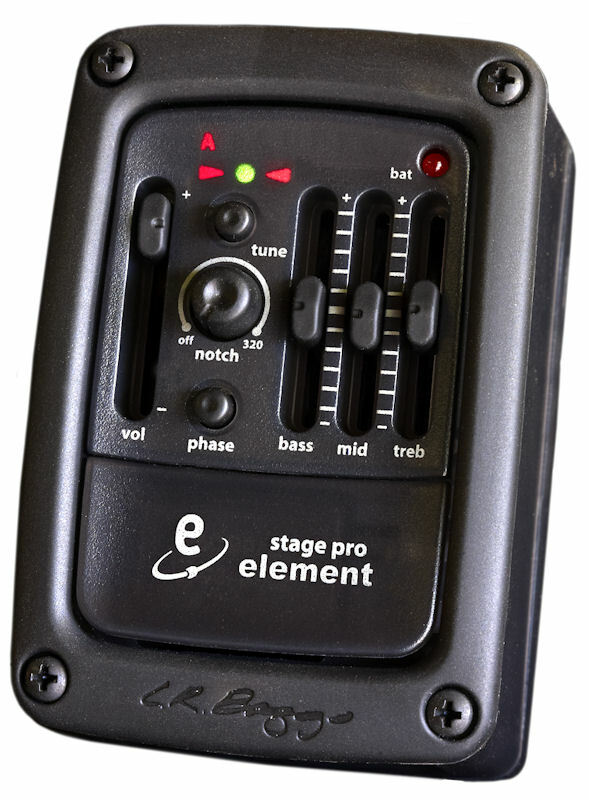 The StagePro preamp features a built in chromatic tuner, with Volume, Bass, Mid and Treble controls. A notch filter and phase inversion help control feedback. The preamp operates on a single 9 volt battery that is easily accessible through the top-mounted click-lock battery compartment. A pure Class A discrete FET input preamp and eq provide a rich, warm analog sound. Preamp dimensions: 3.5" x 2.8" x 2.2"